There has been some buzz lately about hard sodas being the next big thing. Last year, hard root beer took off. This survey of two popular hard root beers by Ethan Lascity explains the idea. While made from a brewed malt base, by the reports I’ve read, they don’t really taste like beer, more like a traditional (non-alcohol) root beer with a punch. Clearly, this has stimulated the idea in some that any soda pop might undergo “hard” treatment. MillerCoors announced recently a line of hard sodas under the Henry name, and the Jed’s line of ditto from the venerable F.X. Matt Brewing of Utica, NY was recently introduced. The category looks to burgeon. 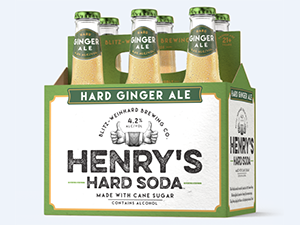 Ginger and orange are flavours out of the gate for MillerCoors: there is Henry’s Hard Orange and Henry’s Hard Ginger Ale. Henry Weinhard is a famed name in brewing on the west coast. Blitz-Weinhard Brewing Co. was a regional independent in Oregon, but descendants of the founder sold the company to Pabst Brewing Company in 1979. It went through a number of corporate ownerships, and the labels are now part of giant MillerCoors. Some people think hard soda will reinforce the soft drink market in the sense that people who might have balked at mixing vodka and lemon soda, say, due to the calorie load of the pop, won’t cavil at choosing a hard soda with a similar taste. 20 years ago, the Canadian-originated Mike’s Hard Lemonade created a sensation that has never stopped and you can get the brand today in numerous flavours. Mike’s provides a link to brewing in that the U.S. version gets its alcohol from a malt base (vs. vodka for Canada), but this is really incidental. It is done for labeling or tax reasons, and flavour is not added by the malt. The hard root beers and now hard soda category use grains as a base to produce the alcohol, indeed fast-rising Not Your Father’s Root Beer appears simply to be a spiced beer. Still, the taste of the flavourings – spices, juice, sugar, etc. – seems the prime focus of these drinks, not malt and hops as such. Hard sodas are “flavored malt beverages” in the U.S., sometimes dubbed malternatives. A malternative has to derive at least 51% of its alcohol from fermentation of brewing ingredients such as barley malt. The alcohol can be 100% from this source but not necessarily, in other words. The labeling issue can get complex depending how the producer wants to identify the drink on the label. Where the product is clearly shown as a beer, I’d guess all the alcohol comes from a fermented cereal mash. I tried Mike’s Hard Lemonade a couple of times (in Canada), and it tasted quite naturally like lemonade with a shot of vodka in it. Vodka coolers, which come in a riot of flavours today, are a similar idea. Wine coolers may have started the alcopop/cooler trend over generation ago. They in turn seemed to emerge from the “pop wine” era of which legendary Boone’s Farm was a pioneer. Gallo today makes Boone’s Farm beverages, generally from a malt base (vs. wine), which kind of brings things full circle. I’ve read a couple of articles which suggested the Henry Weinhard label shouldn’t have been used to brand this new line of drinks, given that is the importance of the Weinhard name and legacy to brewing history. Certainly, Henry Weinhard Private Reserve, first released in 1976, had a definite influence on modern beer culture. That beer, which still exists, advertised the then-new Cascade hop, an unheard of innovation at the time. (The brand was part of an early group of influential beers which helped kick-start the craft era, including Anchor Liberty Ale, New Albion Pale Ale and Sierra Nevada Pale Ale). On the other hand, Blitz-Weinhard was never a craft brewery and the company actually made soft drinks earlier in the 1900’s. In addition to that, it featured ad campaigns and certain products in its heyday which to my mind fit the spirit of the new Henry’s Hard Soda line. Therefore, and as the design and graphic work were well done, using the Henry Weinhard name for the new products made good sense, IMO. People have predicted big times before for different kinds of alcopops, or for cider of course. Cider has done well in recent years but seems unlikely to unseat beer’s dominance any time soon. Brewers know that beer inevitably comes up against the wall in reaching a good part of the mass market. Some people, perhaps the majority of alcohol drinkers, will never get the taste for it and seek other options. While tea, ciders and apple-flavoured drinks of various kinds, and now hard root beer have proved popular, MillerCoors is betting the public will take to what is essentially a “spiked” soda. Mike’s Hard Lemonade of course is a premier example. Maybe Henry’s Hard Soda is the next Mike’s. Note re image above: it was sourced from this newswire story.